Complete care.Key nutrients for growth.Supports healthy digestion.Helps support their natural immune system.From 6 months. ""Why should I choose Cow&Gate? ""Cow&Gate Follow-on Milk provides Complete Care for you baby during weaning.Once your baby starts weaning, milk plays a smaller but essential part of their diet. Cow&Gate Follow-on Milk complements your baby's weaning diet from 6 months, providing the nutrients they need in a smaller volume of milk. It contains added Vitamin D and Iron now their natural iron stores are starting to run low, as well as prebiotics to help support their natural immune system, keeping them happy, healthy and ready for anything.Ready to feed in an instant.Cow&Gate Follow-on Milk for babies 6 months+ is also available as a pre-sterilised, ready made liquid milk, in 200ml and 500ml cartons. Ready to feed whenever your baby is, these cartons are ready to take out and about - which means one less thing for you to think about!If you have any questions about our milks or would like to chat through you options, just give us a ring. We?re available between 8am and 8pm (UK) or between 8.30am and 5pm (ROI). Monday to Friday. Or you can always contact us via our website.Prebiotic oligosaccharides.Iron enriched.Gluten free.Low sodium.Halal approved....because healthy babies are happy babies.Ready for the next stage?As your baby reaches their 1st birthday, it's important that they continue to get all the nutrients and goodness they need. Unlike cows' milk, Cow&Gate Growing Up Milk contains 28 essential nutrients for growing toddlers, as well as prebiotics to help support their natural immune system. Complete care.Key nutrients for growth.Supports healthy digestion.Helps support their natural immune system.From 6 months. "Why should I choose Cow&Gate? 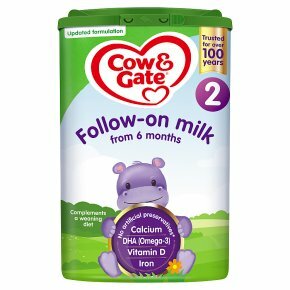 "Cow&Gate Follow-on Milk provides Complete Care for you baby during weaning.Once your baby starts weaning, milk plays a smaller but essential part of their diet. Cow&Gate Follow-on Milk complements your baby's weaning diet from 6 months, providing the nutrients they need in a smaller volume of milk. It contains added Vitamin D and Iron now their natural iron stores are starting to run low, as well as prebiotics to help support their natural immune system, keeping them happy, healthy and ready for anything.Ready to feed in an instant.Cow&Gate Follow-on Milk for babies 6 months+ is also available as a pre-sterilised, ready made liquid milk, in 200ml and 500ml cartons. Ready to feed whenever your baby is, these cartons are ready to take out and about - which means one less thing for you to think about!If you have any questions about our milks or would like to chat through you options, just give us a ring. We?re available between 8am and 8pm (UK) or between 8.30am and 5pm (ROI). Monday to Friday. Or you can always contact us via our website.Prebiotic oligosaccharides.Iron enriched.Gluten free.Low sodium.Halal approved....because healthy babies are happy babies.Ready for the next stage?As your baby reaches their 1st birthday, it's important that they continue to get all the nutrients and goodness they need. Unlike cows' milk, Cow&Gate Growing Up Milk contains 28 essential nutrients for growing toddlers, as well as prebiotics to help support their natural immune system. Feeding Guide 6-24 months.Approx. 1 beaker, Amount of water 210ml / 7 fl.oz, Number of level scoops 7.Cow&Gate Follow-on Milk for babies 6 month+ can be used as a drink or mixed with other foods. From six months, your baby will need about 1 pint (600ml) of follow-on milk per day. Cow&Gate Follow-on Mill is specially formulated to help meet the increased nutritional needs of infants from 6-24 months.Your baby may need more or less than the feeding guide above. This information is given as a guide only. 1 scoop = 4.9g.Always use the scoop provided. The colour of the scoop in this pack may change from time to time.How to prepare.Because powdered milks are not sterile, failure to follow instructions may make your baby ill.1. Wash hands and sterilise all utensils according to manufacturers' instructions.2. Boil freshly run water. Leave kettle to cool for 30 minutes. Do not use artificially softened or repeatedly boiled water.3. Measure the required amount of water (refer to feeding guide) into a sterilised bottle. Do not add powder to boiling water due to risk of scalding.4. Using the scoop provided, level off the powder with the built-in leveller. Do not press / heap the powder.5. Add 1 scoop to every 30ml (1 fl oz) of boiled cooled water. Add the correct number of scoops to the water. Adding too many or too few scoops can be harmful.6. Replace seal on bottle. Shake well (for 10 seconds) to dissolve powder. Remove seal, replace with a sterilised teat.7. Cool under running water. Check temperature of feed. Feed immediately.For hygiene reasons, do not store made up feeds. Make up each feed as required and always discard unfinished feeds after 2 hours.If necessary offer cooled boiled water between feeds.Do not heat in a microwave. Hot pots may occur and cause scalding.IMPORTANT NOTICE.Cow&Gate Follow-On Milk s only for babies over 6 months, as part of a mixed diet. It should not be used as a breastmilk substitute before 6 months, so if you wish to use this product before 6 months we advise that you consult your healthcare professional. It is recommended that Cow&Gate Follow-on Milk should only be used on advice of a doctor, midwife, health visitor, public health nurse, dietician, pharmacist or other professional responsible for maternal and child care, based on baby's individual needs.Never leave your baby alone during feeding. Important notice<br>Cow & Gate follow-on milk is only for babies over 6 months as part of a mixed diet.<br>It should not be used as a breastmilk substitute before 6 months. The decision to start weaning including the use of this product before 6 months should only be made on the advice of a doctor, midwife, health visitor, public health nurse, dietitian, pharmacist or other professional responsible for maternal and child care, based on baby's individual needs.<br><br>Dental advice<br>Do not allow prolonged or frequent contact of milk feeds with your baby's teeth as this increases the risk of tooth decay. Ask your healthcare professional or dentist for advice. Make sure your baby's teeth are cleaned after the last feed at night.